PAN is the Greek god of nature, shepherds and flocks, of mountain wilds, hunting and rustic music. He wandered the hills and mountains of Arkadia playing his pan-pipes and amused himself with the chase or in leading the dances of the nymphs. His unseen presence aroused feelings of panic in men passing through the woods by night. Hence sudden fright without any visible cause was ascribed to Pan, and called a Panic terror. The god was a lover of nymphs, who commonly fled from his advances. Pan fell in love with the Arcadian Nymph Syrinx, an imitator of Artemis both in manners and in appearance, who had until then eluded the pursuit of both SATYRS and gods. Sirynx, desdaining him and spurning his love and prayers, refused to take a sweetheart, who was neither man nor goat. So, escaping from Pan, who pursued her, she came to the stream of the river Ladon in western Arcadia, and not being able to escape, she asked to the Nymphs of the river to change her form, and they, listening to her prayers turned her into marsh reeds. So when Pan wished to hold her there was nothing left of her except the reeds and the sound which the air produced in them. And so, joining reeds of different sizes, he invented the musical instrument that was named syrinx after her, or sometimes Pan flute, after him. Pan was often said to be the son of Hermes, through the nymph Dryope. In the Homeric Hymn to Pan, Pan's mother ran away from the newborn god in fright over his goat-like appearance. 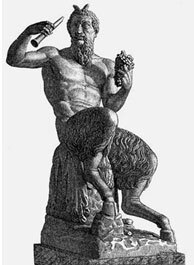 Pan was depicted as a man with the horns, legs and tail of a goat, and with thick beard, snub nose and pointed ears wearing a lynx-pelt. He was often appears in the retinue of Dionysos alongside the other rustic gods. Greeks in the classical age associated his name with the word pan meaning 'all'. Pan came to be considered a symbol of the universe and personification of Nature; and later still to be regarded as a representation of all the gods of paganism itself. 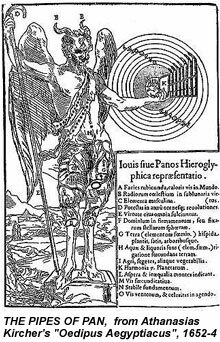 The seven pipe reeds held by the god Pan each inscribe a planetary orbit, symbolizing the ancient Pythagorean belief in a musical Harmony of the Spheres. The planets are arranged in the old Ptolemaic order, orbiting the earth.